When there is a complex problem, structuring well and considering multiple criteria explicitly leads to more informed and better decisions. In our daily lives, we usually weigh multiple criteria implicitly and we accept the consequence of such decisions that are made based on only intuition. But when the stakes are high, it is essential to explicitly evaluate multiple criteria. Multiple-criteria decision analysis (MCDA) is a sub-discipline of operations research. This analysis model explicitly evaluates multiple conflicting criteria in decision making. For example, cost or price is usually one of the main criteria, and quality is typically another criterion, easily in conflict with the cost. This tutorial will elaborate on the following concepts of MCDA with the Decision Tree software. That means you have multiple objectives. So, when you make a decision tree and set a payoff to a node, you need to express the payoff in terms of objectives. Most of the quick decisions are usually involves just one objective "Maximize profit" or "Minimize cost". Therefore, the decisions are based on one single criterion "monetary gain". But for a quality decision, you need to define multiple objectives and set the payoff in terms of the criterion found from that objectives. 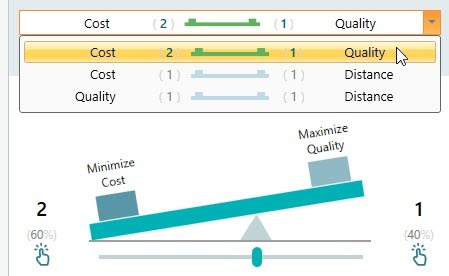 The Decision Tree Software is a modern featured software that allows you to model multiple objectives and let you express payoff in terms of multiple objectives as shown below. So what is Criterion and what is objective? Criterion is kind of a scale where you can express your payoff in terms of that scale. For example, if you have an objective "Maximize Profit". Then your criterion is "Profit". When you set the payoff to a node, you will set how much profit you expect from an outcome in terms of dollars or other currency. Decision Tree Software will let you define your objective easily using it's intuitive user experience and then it will extract the criterion from your objective and ask you to set payoff for that criterion. When you start the Decision Tree Software, you are presented with the following screen. There are two ways to proceed from this start screen. You can start creating the decision tree immediately by clicking one of the buttons from the right side (i.e. Clicking the button "A decision node"). Or you can click the button "Identify your objectives" to set up the objectives first. If you create the decision tree first, then you can set up the objective anytime by clicking the payoff button from the node. If you click the button "Identify your objectives", then you will see the following screen. 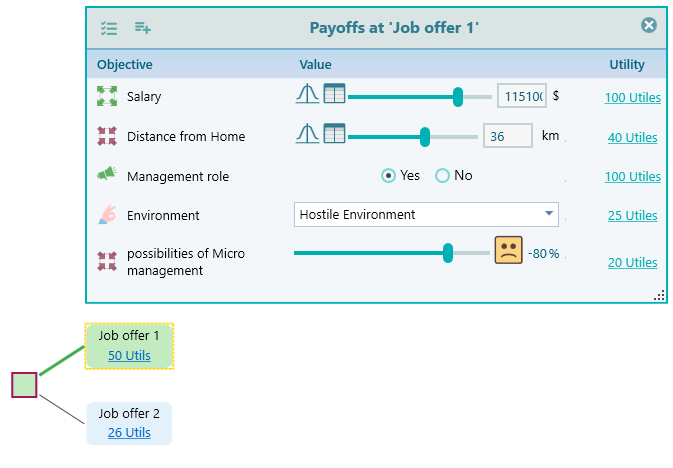 If you chose to create the decision tree first, then for the first time when you click the Payoff button from the decision tree node, you will be taken to the objective start screen as shown above. So, you have the freedom to start with your objectives initially before making the decision tree or you can make the decision tree and then identify your objective later. As Objectives are needed to be identified only to set payoff. Therefore, until you are ready to set payoff to a node, you can easily continue with making a decision tree without identifying your objectives. Once you model your objective like that, your criteria can be extracted easily as "Sale", "Cost", "Time", "Distance", "Neighborhood is good" etc. In the Objective startup screen, select the appropriate objective term from the drop-down box, and enter the criterion in the textbox, as shown below. Once you enter the criterion, click the button "Proceed". Then you may be asked, what is the type of the objective. It basically asks if the objective is a Number type, or Subjective type or Monetary type. There is a reason for this question. If you want to express your payoff for something which is a subjective type (like beauty, comfort, satisfaction etc) or if you simply want to express the payoff directly in terms of utility value (even for money) then you can choose the Subjective type. If you choose the Subjective type, then no more question will be asked. But if you choose the Number or Monetary type, then you may be asked the Minimum possible value, Maximum possible value, unit etc. For monetary type, you may be asked if you want to calculate Net Present Value based on interest rate, which may be useful for financial calculation. 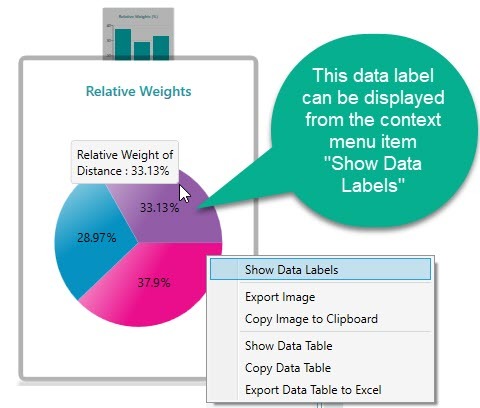 We have explained the criterion data types and usages in details in separate pages. When you have a single objective, you will have a single criterion for a payoff. For example, Say, your objective is to maximize Sales. Then when you set the payoff to a node, you will simply enter the Sale amount (perhaps in dollar or other currency). But when you have more than one objective, we need a way, to sum up, the criterion payoff into a single number. But, you can not add an Apple to an Orange. Similarly, different objectives payoff cannot be combined/summed up. For example, say you are choosing a house to buy and you have 2 objectives. Say, for a house named "house A", you have collected the distance from work as 10km. You have also measured the area as 1500 square feet. Of course, you cannot add up 10km with 1500 square feet like 10 + 1500, right? So, you need to convert them into a common utility scale. Say, 10km can be mapped to a utility value as 0.7. And say, 1500 square feet can be mapped to a utility value a 0.4. Then say, you care the Area 3 times more than the distance from work. Therefore, we can say, in a relative scale of 0 to 1, you have the weight for Area = 0.75 and you have the weight for Distance is 0.25. Because, 3 : 1 means, 75% : 25%. = weight of area * utility value of the area + weight of distance * utility value of distance. Same way, we can compute the overall Utility value of other house options and select the one that has the highest overall utility value. So, we need to convert all payoff to a utility function (either you define a utility function, or behind the scene, the software will create a risk-neutral utility function for you). Once the utility functions are defined, we need a way to sum the utility functions based on some weights for the objectives. The weights are evaluated based on the priority you define. Weight is a fraction number between 0 to 1 such that the sum of all weights is equal to 1. In order to calculate the overall utility value for a node, you need a way to evaluate the weights for objectives. One way of evaluating priorities is to let the user do a pairwise comparison among various objectives and solve a matrix for Eigenvector using the algorithms used in the Analytic Hierarchy Process. Another way is to define the weights directly. Ok, so once you chose the type of the objective, you will be asked if you have another objective. If you answer "No", then things are straightforward and simple. In a decision tree, you will be able to enter the payoff based on that single criterion. But say, you have more than one objective, then answer "Yes". Then you will be able to enter another objective same as you did for the first one. Once you are done with all objectives, then you will answer "No" to the screen as shown above. Then, you will be taken to a pair comparison window as shown below. As you can see, it is a very intuitive user interface where you can express your priority one over another using the weight scale. 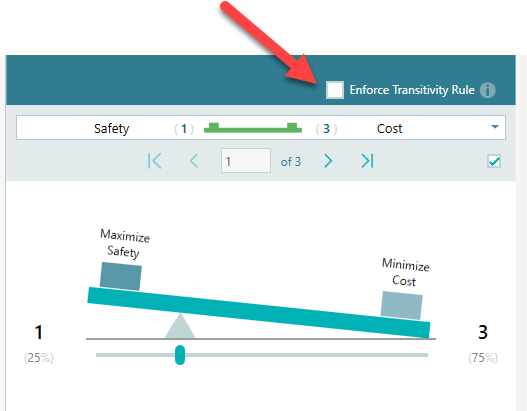 For example, if you prefer to minimize cost 2 times as much as you prefer to maximize quality, then you can set the slider as shown below. In that way, you can set up all the tradeoffs one by one. 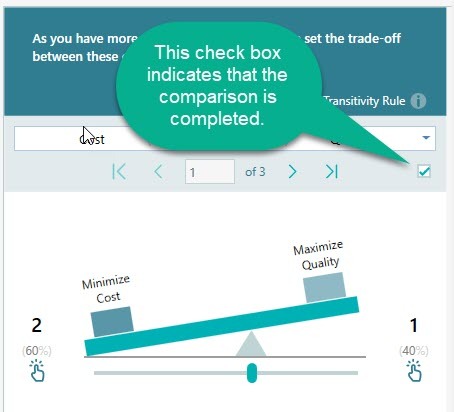 Once a comparison is completed (as soon as you move the slider) you will see the following checkbox gets checked, which indicates that this comparison is completed. That status is set based on your slider movement. But if you really want to set the priorities equal (1:1) then you can manually check that checkbox to mark as completed. You can navigate to the next pair comparison by clicking the navigation buttons on the toolbar. You can expand the drop down to jump to a pair directly. A weight for an objective will be calculated using the same Eigen Value algorithm that is used for the Analytic Hierarchy Process. The relative weight will be reflected in the chart which is displayed in the same panel as shown below. You will also find a Pie chart in the same carousel as shown below. Consistency Ratio metric basically tells you how much you violate the transitivity rule. Let me explain. Suppose you like an apple twice as much as an orange and an orange 3 times as much as a banana. If your preference between an 'apple' and a 'banana' does not reflect that proportion, then you are said to be inconsistent in your preferences. Consistency ratio measures such inconsistency. The higher is this number, the more inconsistent you are. When you are 100% consistent in your preferences, the deviation will be 0. According to Thomas L. Saaty, the consistency ratio should be less or equal to 10%. So, if you notice your consistency ratio is over 10%, it is necessary to revise your judgments. In such case, the software will indicate that using a Red bold color, as you can see on this screen. 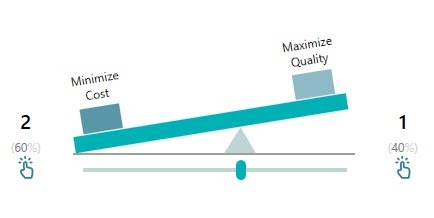 At times, you may want to expedite your decision-making process by bypassing the pairwise comparison and setting the priority weights directly for your objectives. You can do that by unchecking the checkbox as shown below. Once you do that, you will see a panel with the list of Objectives along with a slider so that you can express your priority for that objective. The slider will let you express the priority between 1 to 9. 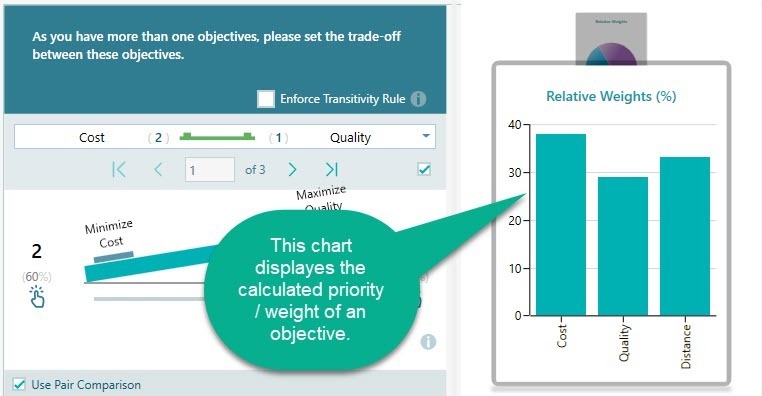 Once you have created a list of objectives, you can navigate to the Objectives page anytime from the Decision Tree window. Look into the Ribbon's View tab and you will find a button "Objectives". Click that button to navigate to the objectives page. In the objectives page, you will see the list of objectives. You can double-click on any objective to open the objective editor. Based on the data type of the criterion, a dedicated objective editor will show up. You can also right click on an objective item to see it's context menu, and from that context menu, you will find the Edit and Delete option. 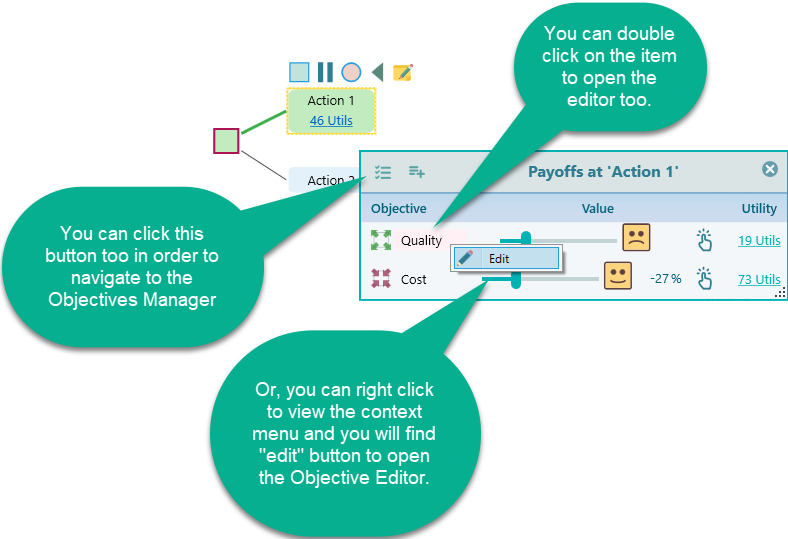 Not only from the objectives manager, but you can also open an Objective editor directly from the Decision Tree Payoff popup. In the payoff popup, you will see the list of criterion values as shown below. As mentioned that, depending on the Objective data type, you will see different Objective editor when you double-click to edit the objective. This is a screenshot of the Objective Editor for the Subjective type. You see that you can disable an objective as well from the context menu. If you disable an objective, the objective will not take part in the calculation. It is very useful in a way that, say you want to check what if you sacrifice an objective, how the final decision is altered. Later, you can enable the objective. If you delete an objective, then you cannot get that back. So, disabling is a very useful feature for what-if analysis.